Dong Pian, or sometimes is called "winter sprout", is a late winter tea that harvests in between the winter and spring harvest. This is usually the young leaves that grow late in the season before the tea plant goes into winter dormancy. Because the plant grows in the cold weather with shorter sunlight, it takes longer to grow and contains higher Theanie. As a result, Dong Pian is usually more luscious and sweet. This season T Shop brought in both Yushan (winter harvest) and Yushan Dong Pian from the same farm. How do we source our teas? We go to the source, we talk with tea people and drink. A lot. We've been experimenting with tea and fruit pairings as a fun way to enjoy some of our favorite teas. This past weekend, T Shop proudly held its first dinner with Kitchen Therapy. In seasonal kaiseki style, Kitchen Therapy paired a six-course vegan dinner with curated teas from T Shop. The dinner showcased fresh vegetable based dishes and how well tea can bring out the nuanced flavors in them. Take the third course, a chawanmushi custard made with taro root, shiitake and shimeji mushrooms that was enhanced by the deep earthy flavor of our 2002 Shou Puerh. This dish grounded our bodies in a mushroom covered forest floor. The tea reinforced a natural setting that reminds us to pay attention to our bodies and the environment. The fourth course, a Soymilk Nabemono made with sake lees, daikon, potato, and chrysanthemum greens was paired with our new Bulang Mountain raw puerh. The richness in this hearty dish was cut by the sharpness of Bulang Mountain, making for a balanced and delicious experience. Even the nuanced flavors of tea can have playful, focused effects on a vibrant dish. Roasted notes from our charcoal roasted Cui Feng oolong danced along a symphony of flavors from a sweet chestnut rice and white miso soup course. 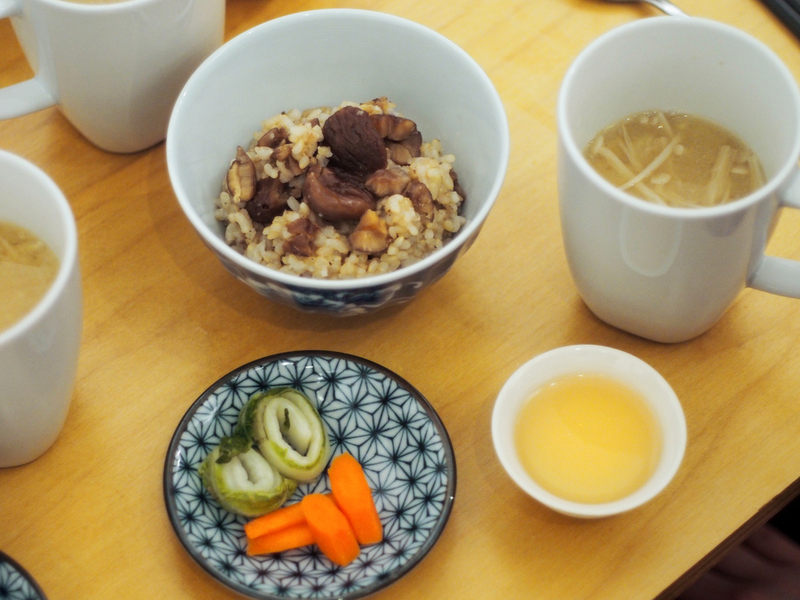 Our guests savored the tea with every bite of rice. The night was a celebration of food and tea. A reminder from Chef Federico that “every bite is an act of kindness towards the body and the earth.” We look forward to our next dinner this Spring season and invite you to join us! My first cup of tea in 2015 was made by one of my dearest friend, Merry. It was Merry’s first experience of making tea, but when she made it with her little magic, I tasted the best steeping of Four Seasons Spring Oolong ever! I have been trying to find a word to describe Merry’s little magic, the closest word I could think of is “passion”! It is the passion that you put in which makes the tea tastes different from others. Passion is not just about passion for tea, but passion for life, so that you’d enjoy and live in every single moment. I always believed the skill of tea making is important, but what’s more important is just simply to enjoy the process of making tea, just feel and be with the leaves. Thank you Merry for giving me the inspiration to start 2015! Jo wrote this at the beginning of the post and I really like it. Opening T shop is by no mean saying that I know tea more than anybody else. The reason for this space to be existed is just to share what we love, getting to meet and share the passion with others. There is no right or wrong about the passion. I just hope with the existence of T shop, more of us would be able to connect and share through the leaf. Meeting tea friends from Long Island on a snow-rain mixed afternoon. Nothing can stop the passion for tea! It’s been 3 months already since the opening of T Shop. I am really thankful for all of you who have been part of my journey and am looking forward to have many more 3 months with you! “Thanks to you, my ruggedness is transformed into smoothness. Thanks to love, my straightforward and outspoken personality has become more refined and diplomatic. From rugged to smooth, my life has more emotion because of the power to change you gave me. Through thick and thin, our affection has grown with each passing day allowing me to experience even greater fulfillment. When I was in Taiwan, I was lucky to have a chance to meet and talk with the ceramicist who designed this cup. He told me that many people would think this cup is designed for lovers, but it actually can be used for other relationships such as friends and families. Today I would like to use this idea and say thank you to my business partner, the co-owner of T shop, Yuki. My tea journey began when Yuki wanted me to accompany her to Fang Gourmet Tea's tea ceremony class. Life has changed since the moment tea was introduced to me. Imagine if I did not become a tea drinker, I might never get to know the people who I met through tea. Yuki was also the one who brought up the idea opening T Shop. When we started working on T Shop, due to the fact that we all have different values, ideas, and ways of handling things, sometimes we had conflicts or hard time communicating with each other. Gradually we learned from the experiences and became more understanding, compromising, and acceptance. Thanks Yuki, because of your trust, support, and hard work, I can do what I always wanted to do. It’s because of you! When I first decided to open a tea shop, I actually did not know what kind of tea shop it was going to be, or how I would want to do it. There was only one thought on my mind: I want to open a tea shop and let more people know about tea! Later I found that my trip to Taiwan helped me to have a clearer idea of what I should do. How my visit to Taiwan affected me is really hard to describe. Yes, I bought tea and teawares to bring back to the shop and I met people and became friends with them. Yet what I came away with went way beyond that. I’ve always known that Taiwanese people are very friendly, yet the hospitality that I received from the people I met really shocked me. They treated me like an old friend they have known for years! All the people I met - the plantation owners, the people working in different tea shops and tea houses, the potters / ceramists, the other tea drinkers or customers I met at the tea places, even the drivers!- all of them were so willing to share! They shared their passions, knowledge, experiences, stories, tea, etc. I truly felt that they were trying to share everything with me! They knew that I planned to open a tea shop in New York and they told me it would not be easy, but they also told me to remember that I am not alone. They really touched me a lot! I was in Taiwan for only 8 days but the whole experience was so warming that I was a little upset about returning to New York. New York is a relatively “cold” city compared with Taiwan, but a friend I met in Taiwan cheered me up and told me to “remember the warmth and happiness of tea, and share this feeling with others”. So this is what I am going to do: open a little, cozy shop in this cold city, and share the happiness with everybody. For me, being able to enjoy a cup of good tea is the happiest thing in the world and I would love to share this experience with everyone.